Set off your '06-Current Chevrolet HHR's 17" five (5) spoke factory rims with this unique and cost-effective Wheel Graphics kit. The set comes with twenty (20) precut decals (no trimming required) with a gradual fade of black and a unique Simulated Carbon Fiber image around the decal edge as shown. Image design is printed on automotive grade clear vinyl with an eight (8) year outdoor durability warranty. As an extra step, pieces are over-laminated with a 2.5 mil clear laminate which will protect the graphics from miles of abuse. 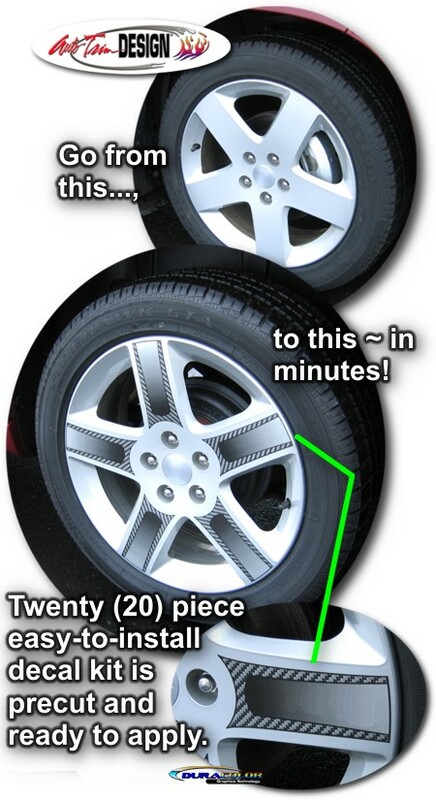 While decals are specifically fit for 17" machined aluminum factory rims shown (generally found on '06-'07 Chevrolet HHR's), with a little trimming the set may fit other rim types as well.